gnar_marr shared this picture of her skate in Hollywood @brooklynprojectsla when she went to Cali – now she’s back in Utah. I’m so happy to see rad shots of girls having fun skateboarding both at home and on their travels. Where are you skateboarding for fun? More girls skate when they see girls skate & we encourage each other. 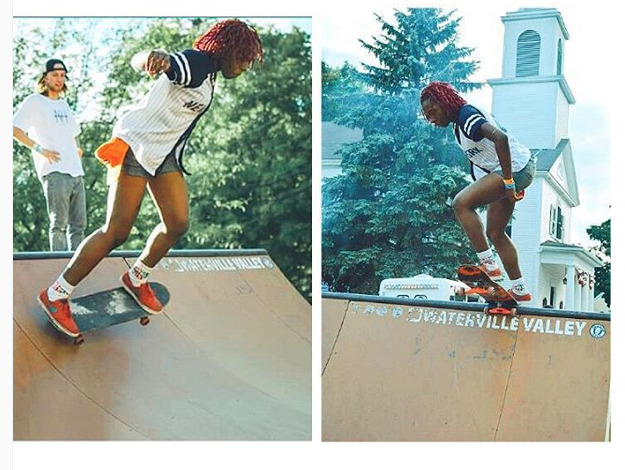 You will see her rolling if you check out the video shared by sheysongz – I just love to see more & more stylish girls start to skateboard and get encouragement. Skateboarding challenges & strengthens you physically & mentally. You can see the look of determination and feel her excitement – just watch the video. Where are you keeping it stylish on & off the board? 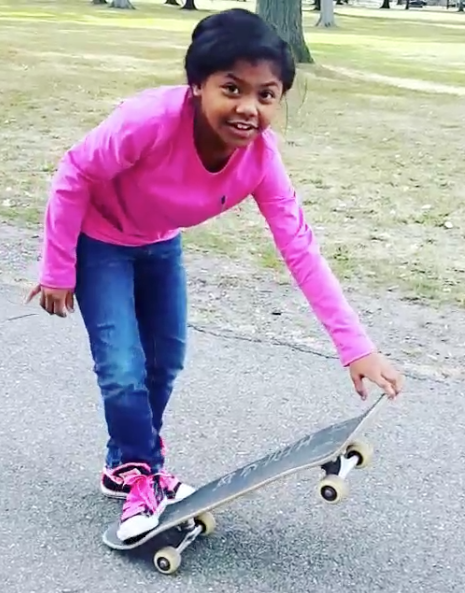 Please take the time to share because more girls do skateboard as they see girls skateboarding! Mummagirls wants everyone to know if she started skating at her age – anyone can. Sometimes we say we don’t do something because we never learned as a kid. If you want something you can either take action and do it or keep making excuses. Thanks mumma for facing your fear – and believe me fear of falling is real – we become stronger when we face our fears and when we share with others how we faced our fears. Keep it stylish on & off the board at all ages! The latest documentary from director Edward Cook is a Tangerine Tree production in coproduction with IKON: Skatekeet. 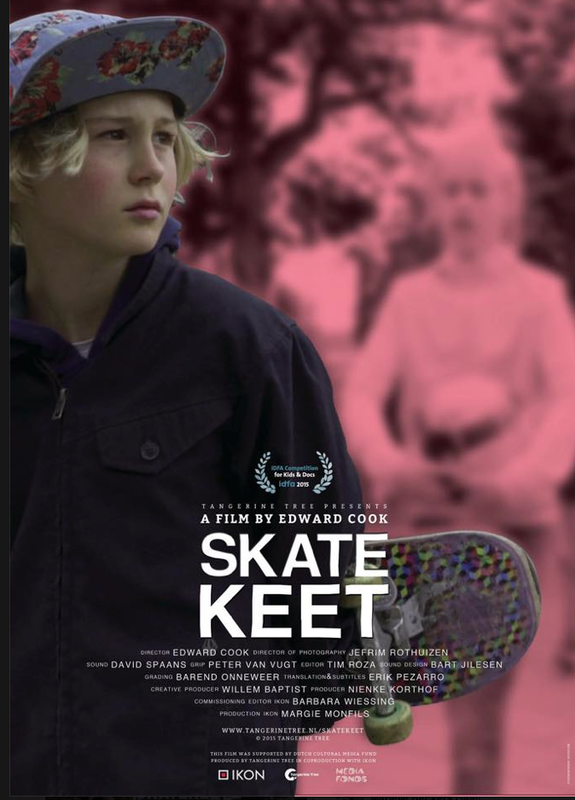 It’s a documentary about Keet (pronounced Kate) Oldenbeuving an 11 year old skater girl from Holland. The trailer can be seen now and the documentary is scheduled to be released this week. I was excited to learn about the film from Feisty a maker of radical gear for girls. Thanks for the tip Feisty – I always want to share stories of girls who love skateboarding and I know this blog is working when people send me stories to share! I haven’t seen the documentary yet – I want to after seeing the trailer. 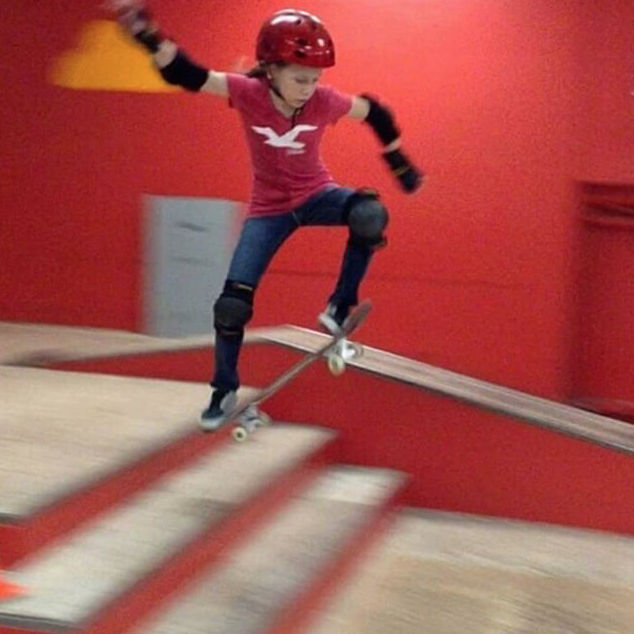 Keet from her FB and instagram accounts is an rad skater who competes against boys. I love that documentaries like this are being made – because the past is when skateboarding was “for the boys” – the present and future is a time where anyone who wants to skate should. I 100% believe skateboarding is sport & art – it challenges you mentally & physically. I love skateboarding because of it’s freedom. There’s no uniform in skateboarding – I can remain true to my style. I can and I will continue to skate in a skirt when I want to. Keet would like it if more girls took up skateboarding. I would like that too & I believe documentaries like this help inspire more girls to skateboard. 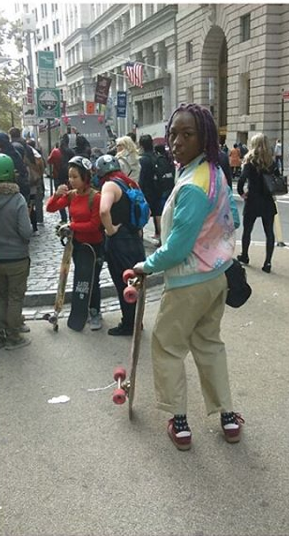 More girls skateboard when they see girls skateboarding and we encourage each other. TBH when I initally got to Cenmass and saw the ramp, I was having doubts on whether I should skate it or not. I didn’t want to get in anybody’s way, or be subjected to harsh judgement, etc. I was thinking of every worst case scenario, upon seeing the mini! But I’m beyond glad I skated it. I had fun, met and skated with some rad people and I even landed a new trick! I braved up against lingering doubt and against a ramp that I considered to be kinda tall (this is the tallest I’ve ever skated lol). We all have fears – I especially fear and hate being judged & really who wants to hear harsh criticism? I find it so inspiring to see and hear that other girls have these fears & skate anyway. At least for me – it’s not about my skill level – it’s about my fun level. I’m so happy for Yasmeen that she faced her fear, had fun, and now shares so others can get inspired. CONGRATS Yasmeen and I love how you travel & skate with your board. Everyday is a good day to skate. Some days are just more special – maybe because you meet with friends, or have a lesson, or ??? 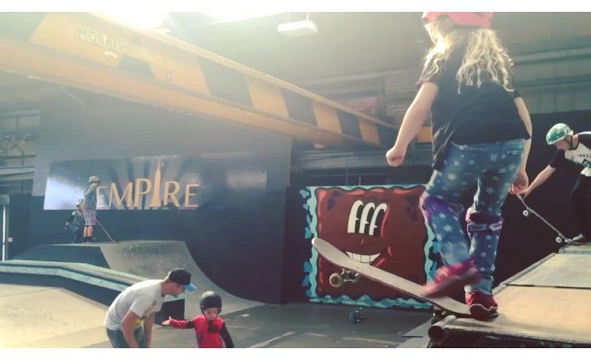 Tabitha shares this picture from her Saturday morning at the Empire Skate Park Essex. 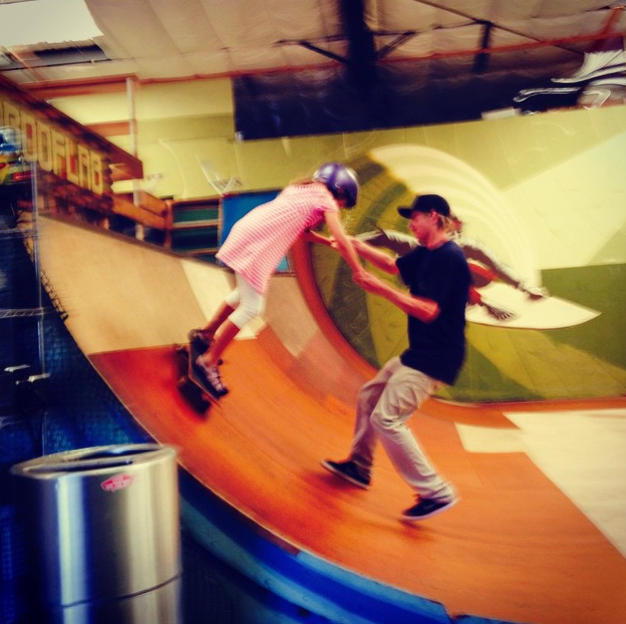 The park is 100% skater owned & operated – so of course they are open 7 days a week! Love your style Tabitha – you are a star. Keep shredding & keep sharing that’s how more girls see skateboarding and then try skateboarding. Brooke shares this picture from Arizona. where Abrielle shared a picture and her wish that she see more girls skateboarding in Arizona. 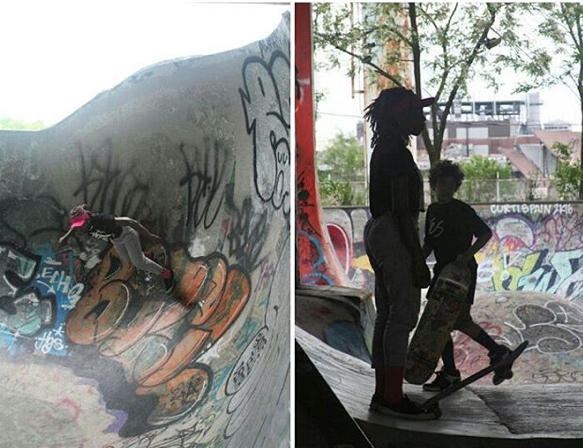 More girls skateboard when they see girls skateboarding and we encourage each other – so are you with us? If so tag me or send me your skate pictures. On my mission to get more girls skateboarding for fun & keeping it fashionable, I get to meet a lot of people – actually more people than I ever would have guessed. I am so lucky to meet people that are out there being the change they want to see. I had to find out more. I’m really glad I took the time to look at both their super cute collection and read their About Page – it’s a page that left me feeling inspired & charged up! If you believe in girl power – my interview with Gina is the one to read – it goes beyond skateboarding or any other one sport to really talk about the power all girls have and the power that can be unleashed when we work together! Read on, sisters, read on! 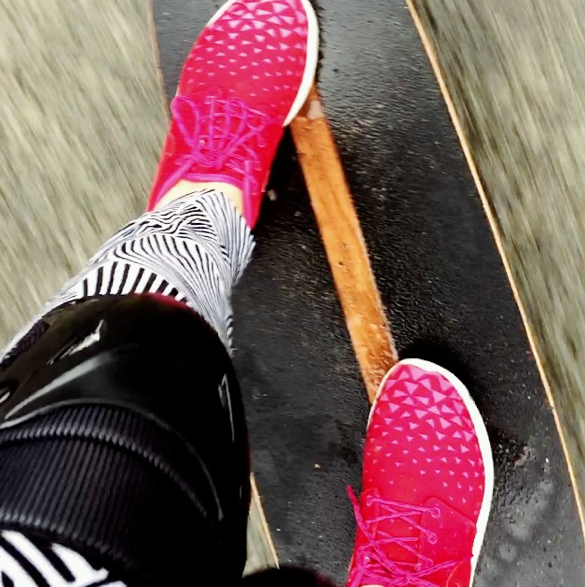 SF: I read that SheShreds.co started as an act of rebellion with one goal – to help girls shred without limits – what originally got you going on your mission? What got me started originally was my FRUSTRATION for the tiny amount of product and support for females in action sports. So I started out kind of angry/rebellious but realized, I don’t want to put any negativity out there. I wanted it be about having a positive impact on females in action sports, shaking things up in the industry and putting a positive and supportive message out there. 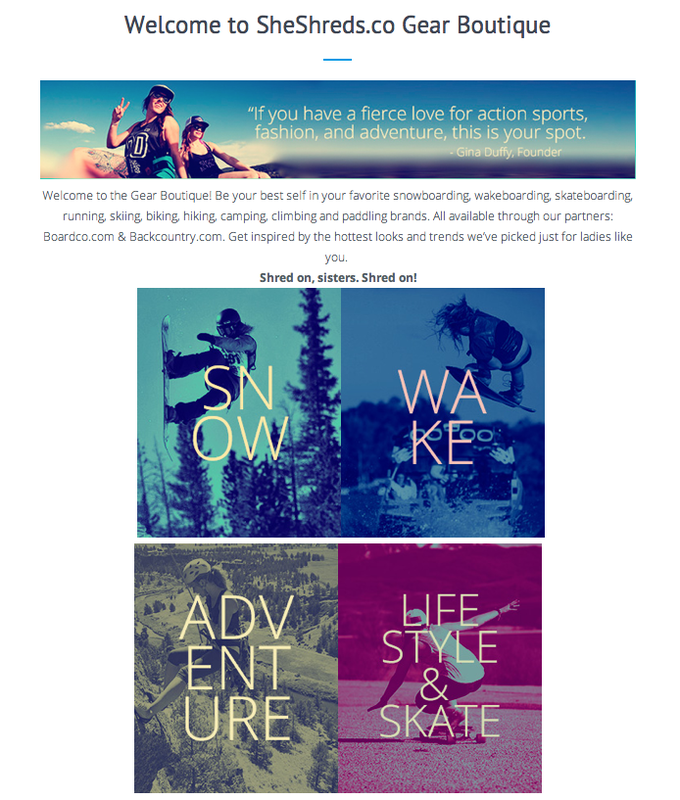 SF: SheShreds.co was born out of your fierce love for action sports, fashion, and adventure. What was the original reaction you received? Over time have more people embraced that girls can be both active & stylish? We’ve gotten a positive reaction since day one. Many people, athletes, other companies said, “It’s about time. This needs to happen.” We’ve been fortunate that people really connect with our mission and our cause. We received such an outpouring of excitement from girls who ride, it’s been a really amazing experience being able to connect with all these incredible girls around the US and in other countries and building our own “shred network”. Girls want to feel good and express their own personal style when they’re riding and we’re helping them accomplish that with our branded apparel. We like to call our branded apparel a “badge of empowerment”. 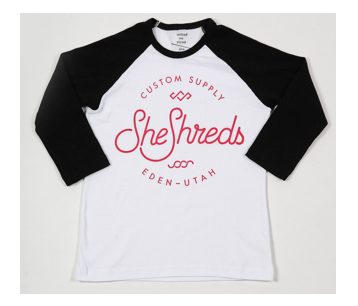 Wearing our gear while you’re out shredding and knowing you are part of a movement to support females is empowering! One of our team athletes, Liv Hetzel, a skateboarder & snowboarder from Wisconsin summed it up perfectly, “Even when I am at the skate park or on the hill riding by myself, I never feel alone now that I’m a part of SheShreds.” That is EXACTLY what we are trying to accomplish. SF: SheShreds.co values are Passion, Freedom, Style, Courage, Pain, and Support – which I love & believe in – how do you think we get more girls working together and building each other up in sports rather than competing against one another. I’ve heard the reason there’s so much competition is because there’s a belief that there’s limited support for women athletes – your thoughts? Thank you! As a shredder, you know it takes ALL of those qualities to ride and push yourself. But I think support is the MOST important. It’s funny, I just had a conversation about the competitiveness that can sometimes turn to cattiness with a pro snowboarder recently. We just don’t get it. Maybe we’re optimists! Yes, I think some of it has to do with the limited opportunities for females for sure. Everyone is trying to claw and scratch at the same tiny little nuggets. But, I think some of that has to do with society and girls feeling like they’re always being judged in every aspect, including in ways that they have no control over (like the way you look). At SheShreds we are all about building each other up and inclusion. We’re just as stoked about the girl who is just learning and getting into these sports as we are with pros who are breaking barriers. Each and every female who participates in these sports is super important. Without more girls getting into these sports we all fail. So if girls want more opportunities, it’s extremely important that they help encourage and introduce other girls to these sports. SF: I’m the skatingfashionista so I’ve got to know – what’s your favorite piece in the collection? BTW I’m loving the baseball tees and that you have girl sizes – I love to see young girls wearing clothes with a strong, positive statement. First of all, I LOVE that you are “the skatingfashionista”. That’s so rad! Let’s see, it’s hard to pick, but I love a good baseball tee as well and if it has a positive empowering message, even better. We need to remind ourselves how fierce we are on a daily basis! We’ve got some really cool stuff coming out for Fall & Winter in a few weeks! SF: People can find out more about SheShreds.co on Instagram and your web site – are your also available in stores or boutiques – if so where? Right now we only sell online on our website. We wanted to concentrate on supporting females and female focused events and building our audience. We definitely plan to be in stores and boutiques in the near future! SF: You have an impressive Ambassadorship Program – when did that start and how can girls become part of the community? We had an incredible amount of girls (young & old) reach out to us because they wanted to be a part of the company, the brand and this movement somehow. They were so excited about our mission and message of female empowerment. 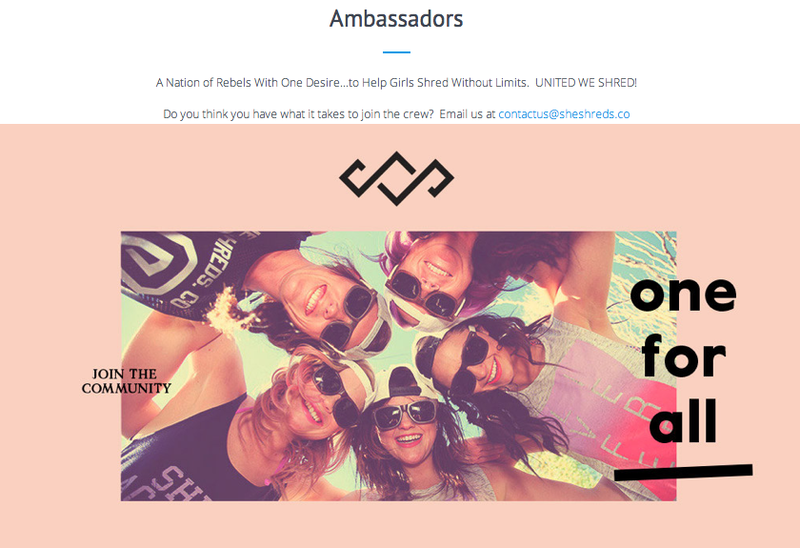 We knew we had to do something with all of this momentum and we created our ambassador program. Each girl is riding at different levels, but what is most important to me are that they are the MOST PASSIONATE! Some have overcome near death car crashes and told they would never walk again or deal with debilitating heart disease and these sports are what give them purpose. Some have lived out of their cars to have access to the sports that they live for. These are the girls who I want out there representing our brand and introducing it to other girls. If you’re passionate, if you’re fierce, if you’re cool, kind and positive hit us up at contactus@sheshreds.co and tell us why you’d like to be on the crew! SheShreds.co is living & breathing the positive change – they are out there sponsoring events like the female divisions for the Only Online Global Wake Competition and EXPOSURE Skate. What’s Better than One Girl Dropping In? What’s better than one girl dropping in? That’s easy – more than one girl dropping in is even better. Jannicaback shared this picture from a ramp in Umea. And if you don’t know where Umea is – you’re not alone I had to google it. Umea is in Sweden. This blog and its Instagram are all about more girls skateboarding because they see girls skateboarding and having fun. I’m always inspired by the number of real skater girls I see around the world. And by real I mean on a skateboard because they want to be not because it’s a prop in a photo shoot. Skateboarding popularity goes in trends and we are on an upswing now – I hope it levels out high because I believe skateboarding at any level on any board is good for the mind and body. Skateboard because it’s fun and skate with people who skate just because it’s fun. Fun is always in style! Doing things just because they are “popular” not so stylish. So till next time keep it stylish on & off the board! What were you wearing at your first skateboard lesson? I actually don’t know what I was wearing – but I know Faeryn was wearing stripes thank to amythebrat for sharing. There are people who think skateboarding shouldn’t be taught. I respect their opinion and maybe for them it’s true – I know you can be an incredible skater without taking lessons. But if you have the opportunity for lessons – why not? I totally believe in positive vibes & doing better at something because someone is encouraging you – someone who’s been there, done that, and knows you’ll live! The other part of the story I love – Faeryn wanted to try skateboarding because she watched big kids around the county! Please keep sharing your pictures and stories – someone might not have “neighbors” to see skateboarding but they can see you in this blog & be inspired to give it a try themselves.